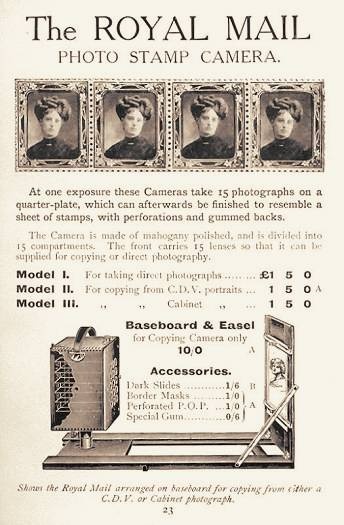 The two advertisements shown on this webpage, possibly representing the first and last years of manufacture, offer a rare insight into how the marketing of a camera matures over the years. 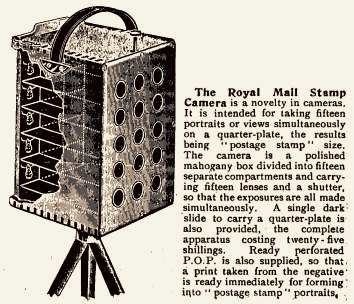 By the time the Royal Mail Stamp Camera was discontinued, interchangeable fronts and a specialized baseboard & easel for the copy camera version were offered. Special thanks to Eaton Lothrop for sharing the references.